Pineapple Upside Down Dump Cake – This EASY pineapple upside down cake recipe has only 4 ingredients!! Simply dump the ingredients into the pan and bake. The easiest cake recipe EVER and it feeds a crowd! Anyway, now that you’ve forgiven me my sins, I subscribed to Hulu pretty much because I could watch the entire series from start to finish. I’m up to the end of season 7. Apollo just went to jail, Phaedra filed for divorce, and NeNe is fed up. I am loving EVERY SECOND. Like, it’s all I can do right now to write this and not escape to my bubble of RHOA. Now, I’m not up to date on season 9, but you have to be living under a rock to not know the drama that’s going to occur between Kandi and Phaedra. I’m a Bravo-addict so of course I know what’s coming. Season 7 is where their friendship starts to fracture and I just want to shake Kandi and be like, GIRL. GO CALL HER. Make an effort! She’s hurting! She’s gonna do you wrong if you don’t get your act together! 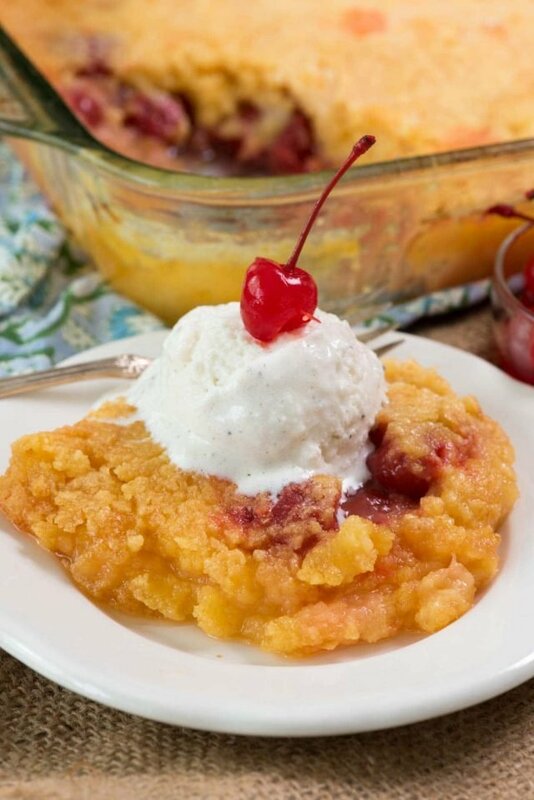 All this watching Atlanta has me thinking about the south and southern food…and that brings me to our newest DUMP CAKE recipe for today: Pineapple Upside Down Dump Cake! Last month, when I made my Cherry Berry Dump Cake, I got so many comments about all the different flavors people make. Peach, cherry, lemon, chocolate…I want to try every single one. The one that was brought up most was pineapple with cherry pie filling. I thought to myself, of course that’s popular: it’s a Pineapple Upside Down Cake! So…I decided to give that recipe a home right here on the blog: a pineapple upside down DUMP cake…where you just dump it all in. Easy as pie…or cake, that is. Get two cans of something: pie filling, fruit, etc. Dump them all into a pan. I hope you enjoy, this is the perfect summer potluck recipe. Also: TEAM KANDI over here! Pineapple Upside Down Dump Cake - This EASY pineapple upside down cake recipe has only 4 ingredients!! Simply dump the recipes into the pan and bake. The easiest cake recipe EVER and it feeds a crowd! Preheat oven to 350°F. Spray a 2.8L casserole dish or 9x13” pan with cooking spray. 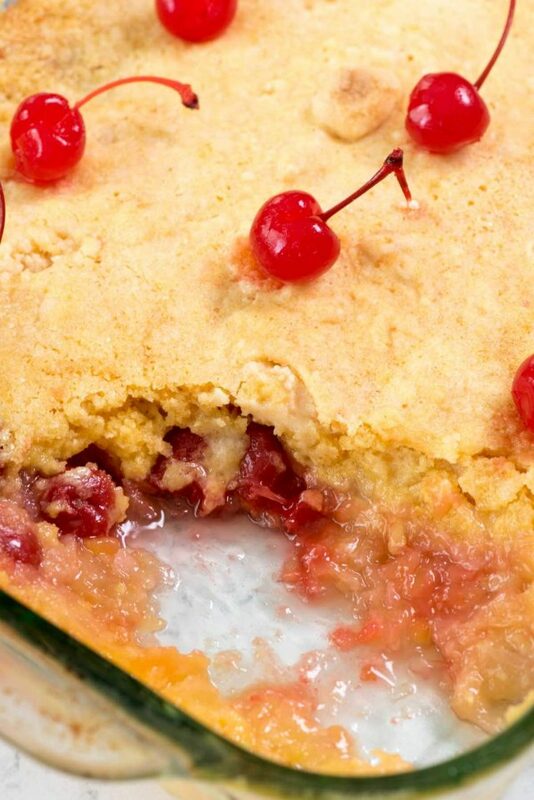 Pour the crushed pineapple (with the juice) and cherry pie filling in the bottom of the dish. Open the cake mix and sprinkle the power evenly over the top. Pour the melted butter evenly over the top of the cake mix. Make sure to make it even so that it all cooks into the cake mix. Bake for 35-45 minutes until the fruit starts to bubble up around the edges and the edges start to turn golden. I baked mine in a casserole dish that was deeper than a 9x13” pan so it took 40 minutes. Different pans will have different baking times, so start checking after 30 minutes. Serve with ice cream or whipped cream. Store covered in refrigerator. 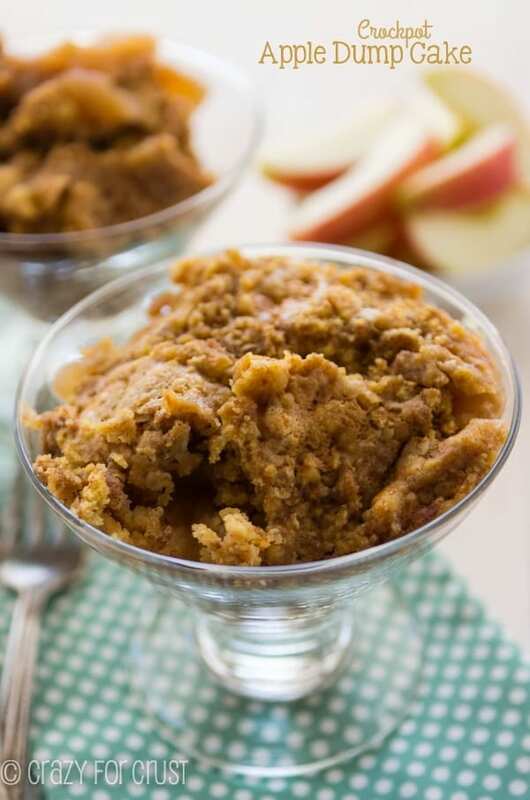 If you love dump cakes like this be sure to see my other dump cake recipes below, and check out all my cake mix recipes. 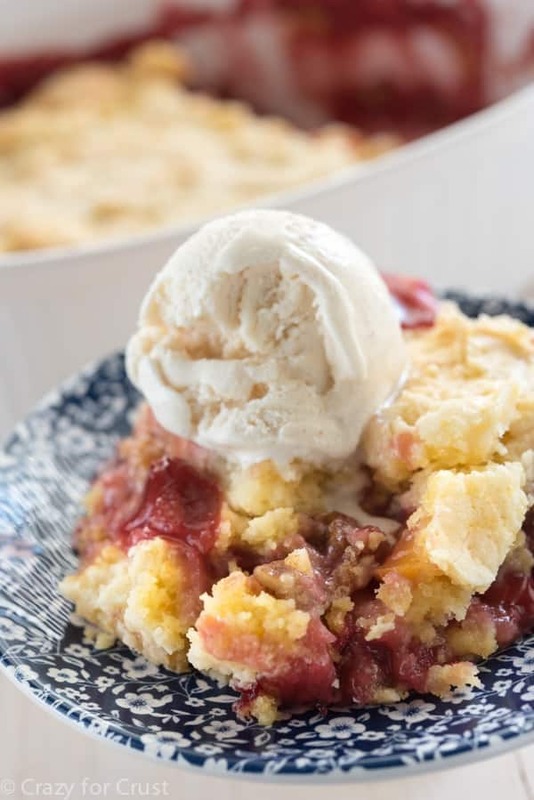 And check out these favorites too: Caramel Chocolate Dump Cake by Taste and Tell or Lemon Blueberry Skillet Dump Cake by Shugary Sweets. I did have to skip some of the reading, as I also like RHOA, but only catch it once it hits HULU, so I am a few seasons behind. My wife makes fun of me, as all of the housewives shows are sort of my television that I like to play in the background. This cake, however, looks great. I used to watch RHW Atlanta but didn’t stick with it. Nene is my favorite though 🙂 I can’t wait for new seasons of OC and Beverly Hills! I bet this cake is so good! I love pineapple cake in any form! Definitely a southern dish. Looks great! No matter how carefully I pour the butter, I always end up with a (partial) dust cake. However, I recently saw a slow cooker version where the cake mix & melted butter were simply mixed together first. Duh! Why didn’t I think of that? I am 65 and have been eating this cake since I was in my 20’s. Always one of my favorites to make or to eat. Been making this with my family since I was little! Top with pecans or shredded coconut!! I’ve been making dump cakes for years. The picture of your cherry,pineapple looks very mooshy. Or wet. Is it ? Seems like sprinkling some brown sugar on top of pineapple mixture before sprinkling cake mix would be good. Has anyone tried it? 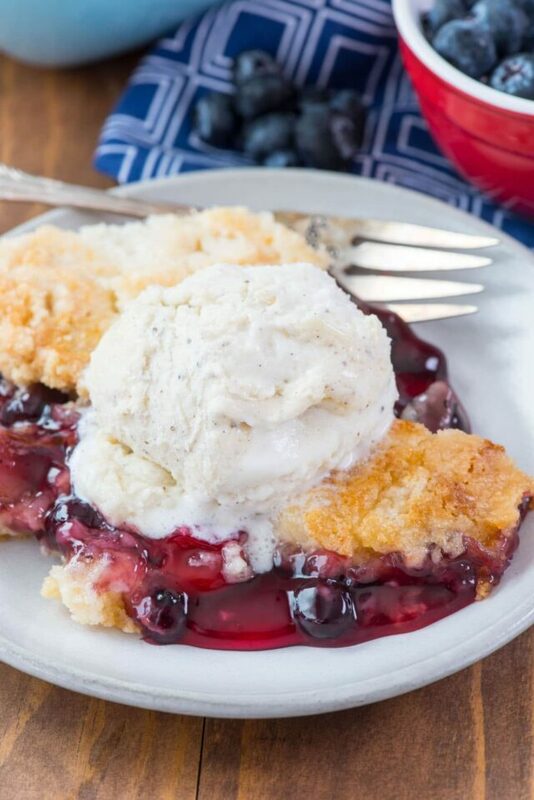 Is there a way to make this with cherries packed in water rather than cherry pie filling? With left over pineapple tonight I knew just what I wanted, but my own ancient recipe is misplaced, so I googled, and it brought me here. I knew I could trust yours to be every bit as good as my old one, and it is! It’s not rocket science but I like to refer to a recipe anyway.